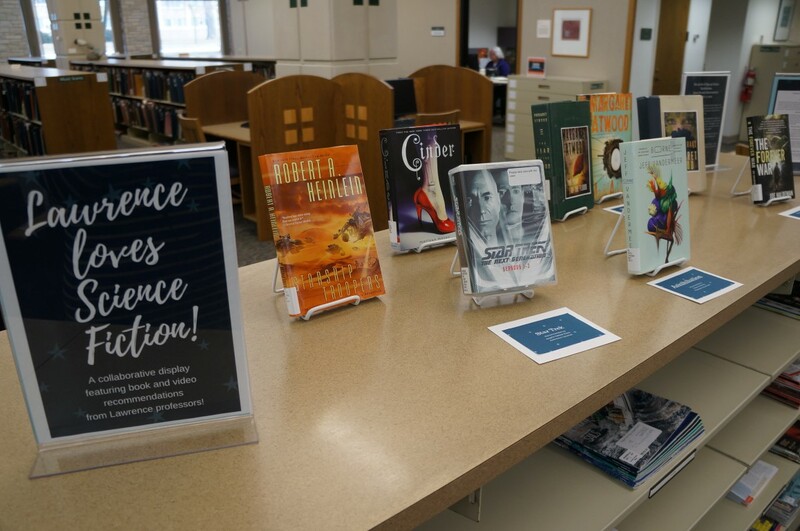 This term the Mudd Library has partnered with professors from around campus to create a display celebrating science fiction! 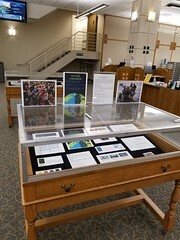 The display is meant to highlight several winter term science fiction courses currently underway. Chloe Armstrong is teaching Science Fiction and Philosophy, Amy Ongiri is leading a class called Queering Science Fiction Film, and Jason Brozek is heading up a weekend retreat to Bjorklunden to study War and Science Fiction. Below we’ve shared science fiction recommendations from professors across disciplines. 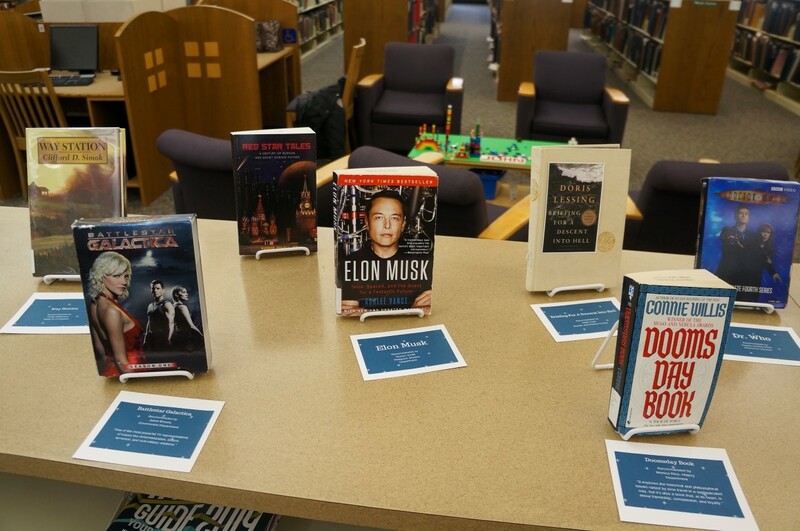 Our library display, located on the first floor, includes many of these recommendations, and more! Starship Troopers (1997) – This is right up there with Kubrick’s Dr. Strangelove as one of the best military satires of all time. Battlestar Galactica (the rebooted series, 2004-2009) – One of the most powerful TV representations of issues like dehumanization, torture, terrorism, and civil-military relations. The Forever War by Joe Halderman (1974) – The plot is about humanity traveling light-years to fight an interstellar enemy, but this book is really about how the experience of war fundamentally changes the people who fight it. Doomsday Book by Connie Willis. It explores the historical and philosophical issues raised by time travel in a sophisticated way, but it’s also a book that, at its heart, is about friendship, compassion, and loyalty. Please come in and visit our display if you are on campus! We hope you will consider reading or watching some science fiction, and that you live long and prosper, too! 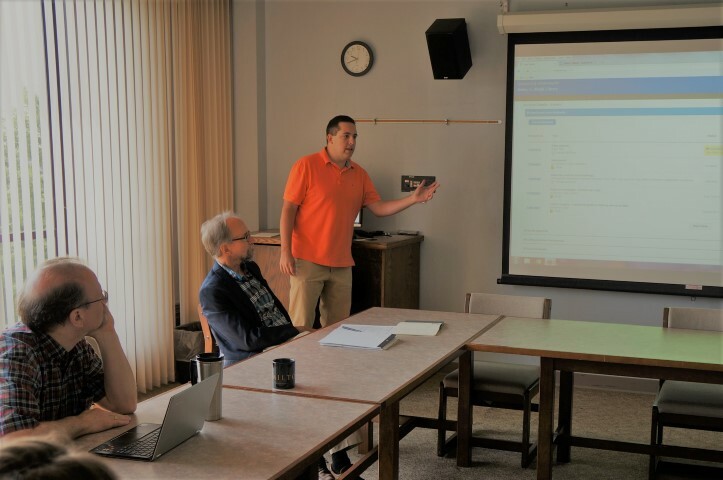 People all over the world have accessed honors projects, issues of The Lawrentian, and convocations in the six years since Lux was implemented through the library. We have now reached 300,000 downloads! What is this Lux? Lux is the Lawrence University institutional repository, digital home to over 4000 scholarly and creative works of our students, faculty, and staff, as well as select historical documents. If you are looking for interesting stories from student newspapers or alumni magazines, check Lux! You will find a rich and fascinating history. Want to peruse recent honors projects? Lux is the place for you. Interested in reading a Harrison Award paper? Studio Art senior exhibition artwork? Look in Lux. You will find these things and many more. We hope you enjoy and are enriched by what you find in Lux! Let us know what you think. Summer is here and it’s time to enjoy the Mudd in a whole new way. The Library transforms over summer break, as most of our students are away and the busy bustle of the academic year has subsided. 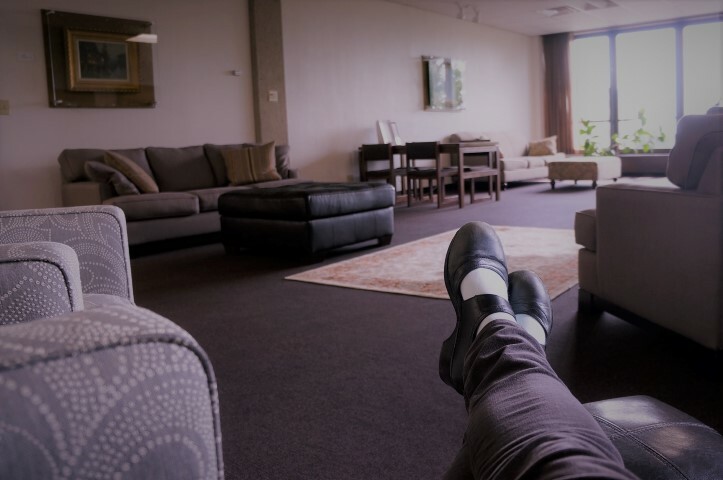 Cool down and take a load off in the Kruse Room on the fourth floor. Of course, you’ll find an industrious student or professor or two huddled around a laptop, but for the most part, it’s fairly quiet around here. This peaceful, settled atmosphere allows our resources and spaces to appear in a whole new light. Relax with our popular magazines. Come to our coffeehouse sessions! This is a summertime Mudd must! Enjoy the air conditioning while catching up on local, national, and international news with our large selection of newspapers or popular magazines. It’s finally time to binge watch your favorite TV series! Or, some popular or classic movies. We’ve got a ton of documentaries and musicals, too. Browse the DVDs in the media center, or check out our streaming resources (You’ll need to log in). Make an appointment to FINALLY check out the Archives. Board games are on the 2nd floor. We have video games, too! Challenge your family or your nemesis to a game night! We have both video and board games for check-out, or, stay and play! Wander around the building to appreciate our art. Pay homage to The Katie while you’re at it. Find a fabulous summer read! Stop by our coffeehouse on Wednesday, July 12 for our recommendations. Or, peruse the third floor for the latest and greatest in popular fiction and young adult or graphic novels. Of course we have poetry and classic literature, too, as well as some really compelling nonfiction. 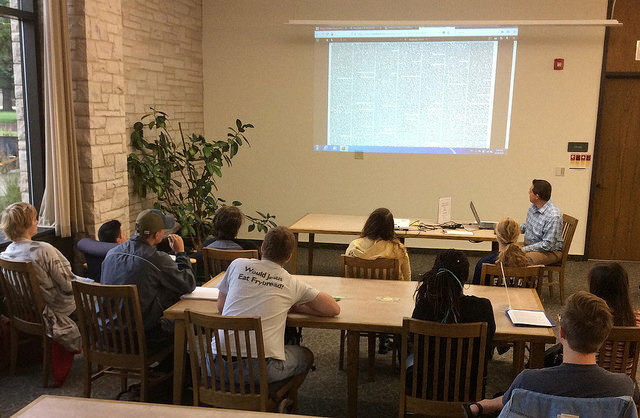 Contact a reference librarian and ask for a peek at some of the rare books in our special collections. 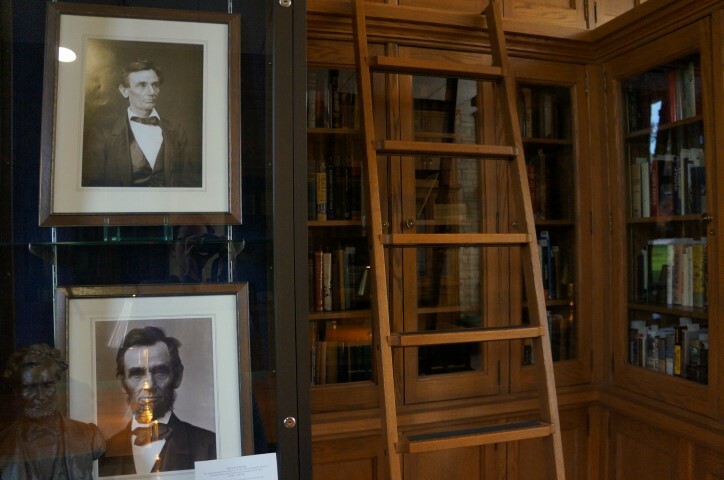 Soak up the scholarly atmosphere while developing historical perspective and appreciation in the Lincoln Reading Room. Come and introduce yourself to the staff and faculty who call the Mudd home. We enjoy getting to know members of the campus community and this is a great time of year to catch us with a few moments to talk about our work, the library’s offerings, and how we can best serve our community. 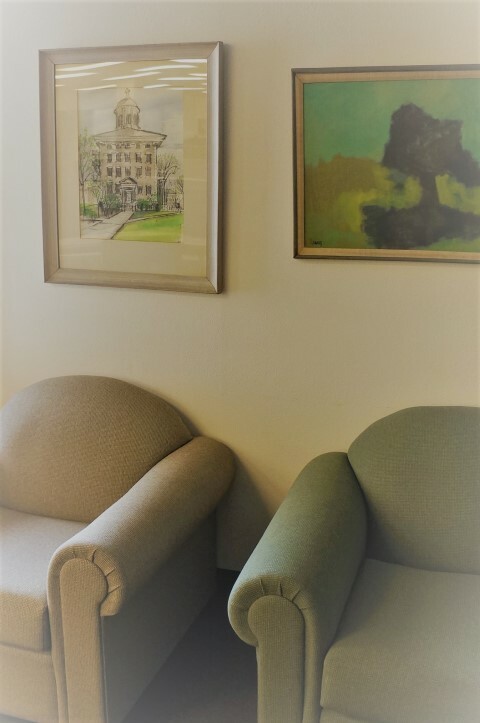 Lovely art, natural light, and cozy chairs. Summer is here and so are we! We strive to make this library a welcoming, comfortable, peaceful, productive space, and we encourage you to make the most of it, regardless of the time of year. Whether you’re reading, researching, or relaxing, we’d love to hear how you’re using the Mudd this summer! We are so grateful when our hard-working students take time out of their busy schedules to share what they’re up to in the library! 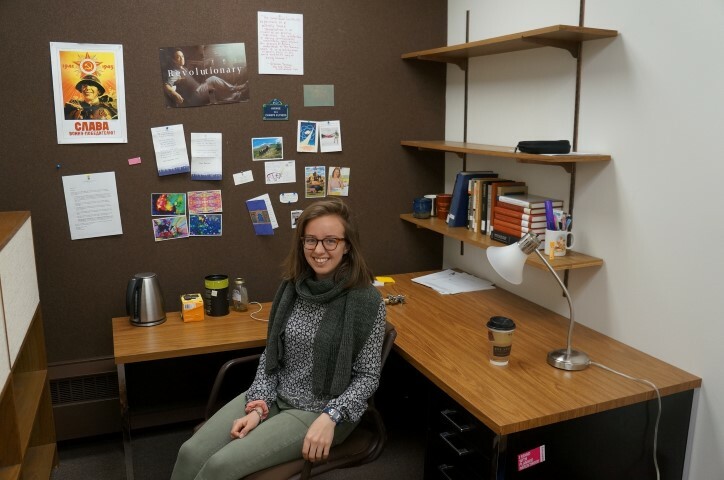 Sierra Parker has been spending an awful lot of time in her student office this term. The Linguistics and Russian Studies major is from Michigan’s Upper Penisula and will be graduating in June. Sierra plans to attend graduate school to study communication disorders after taking a year or two off to work with FoodCorps (a branch of AmeriCorps that helps start school gardens and educates kids about healthy foods) or the National Park Service. Sierra, what are you researching? I am researching aphasia, a language disorder. People with aphasia lose the ability to find words and/or use them coherently. More specifically, I am looking at how aphasia was studied by two Soviet psychologists: Alexander Luria and Lev Vygotsky. I am interested in what they believed about aphasia, as well as the chain of thought that led them there. I am fascinated with how people with aphasia experience the world. I am hoping to gain some insight by learning more about conceptions of aphasia that differ from the modern Western approach. I believe it is always important to step into someone else’s shoes (in this case: people with aphasia, Vygotsky, and Luria) and try to see the world from their point of view. Also, Western histories of aphasiology tend to overlook the groundbreaking work done by Vygotsky, Luria, and other Russian/Soviet psychologists. I took the class Brain & Behavior, which introduced me to aphasia. As someone who has always been interested in language, I was stunned by the implications of losing it. I instantly wanted to know more about the disorder, as well as the lives and minds of those who live with it every day. The library created a research guide specific to my senior seminar, which has been extraordinarily useful. The PSYCInfo database has been helpful, as well as the fact that the library owns four volumes of Vygotsky’s Collected Works! Apply for an office! They are a big help, especially if you are planning on using many books from the Mudd’s collection. Also, do not be afraid to ask the librarians for help. That’s what they’re there for! Thanks, Sierra. We couldn’t have said it better ourselves. See you around the Mudd. 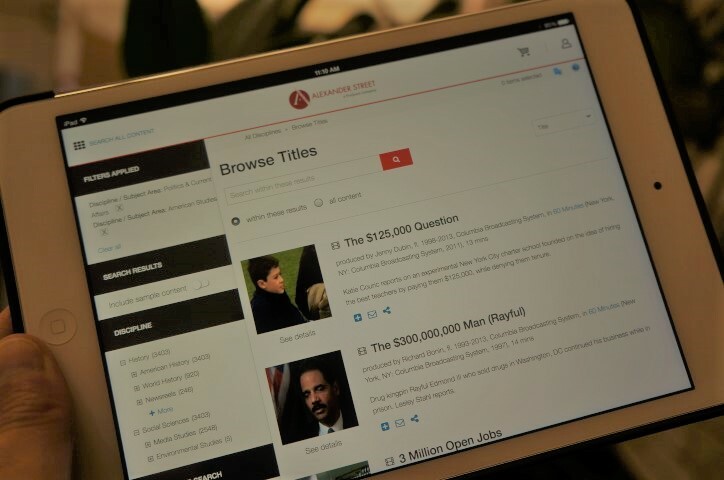 Did you know that the Mudd Library subscribes to multiple streaming video resources? These resources cover theatre, opera, newsreels, documentaries, and much, much more. 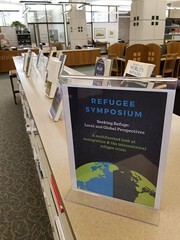 Like many of our databases, these can be accessed on campus or off campus with a Lawrence University login. Digital Theatre Plus is a collection of British performances, cast and crew interviews, learning resources, theory and criticism, and more. Plays and productions range from theatre to film to dance, covering many genres and time periods. The number of performances and resources available in this database has greatly expanded since we subscribed a couple of years ago, so now’s a great time to take another look! Met Opera on Demand contains video and audio access to over 600 performances from the Metropolitan Opera. Performances date up to the current year, and can be searched by opera title, composer, or artist. Academic Video Online is a vast collection of videos that covers an extensive range of subject areas and video types. This collection contains news reports, documentaries, music & performing arts, newsreels, instructional materials, health sciences resources, and more. Database features include the ability to clip and share videos, searchable transcripts, and the option to send to mobile. 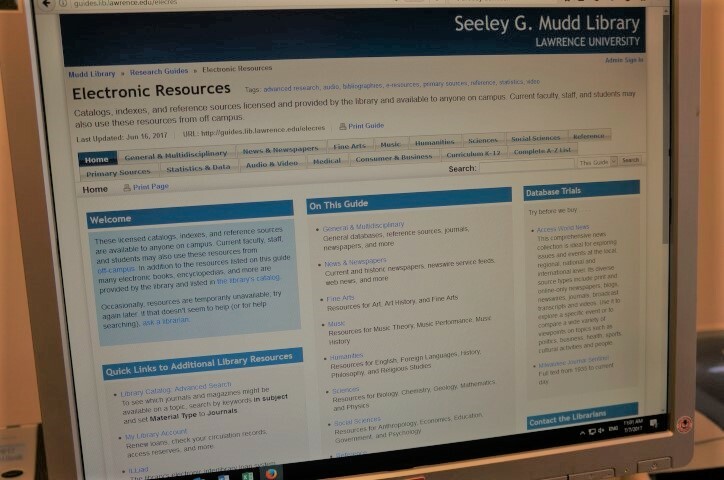 Be sure to take a look at these amazing resources brought to you by your friends in the Mudd Library! Have questions, ask a librarian. The library offers so many resources and services, it can be hard to keep track of all the ways in which we can help you succeed at Lawrence. Below you’ll find a handy list of just a few ideas for optimizing your experience in the Mudd. How many have you employed? Lots of seating for lots of studying. Grab a study buddy and a rolling whiteboard to parse out those tricky formulas. Head for the quiet solitude of the fourth floor and hide out in the stacks to read. Contact a reference librarian for research assistance or make a research appointment: visit the desk, call, email, or text! Watch a movie for class or relaxation in one of our five viewing rooms. Books and art and standing desks! Browse the fiction and graphic novels on the third floor during a study break. 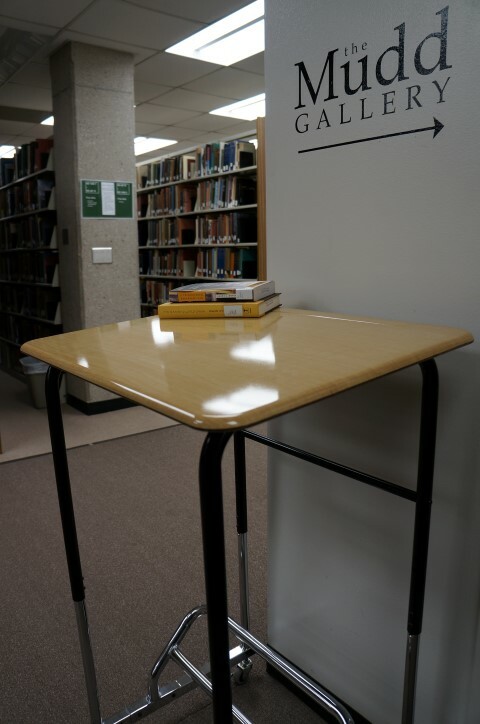 Wheel one of our standing desks to your favorite spot to focus. Lounge on one of the comfy couches in the Milwaukee-Downer Room (1st floor) or in the Roger Dale Kruse Room (4th floor) while doing your class reading. Reserve a group study room on either the 2nd or 3rd floor by signing your name on the clipboard outside the door. Invite your friends for an intensive study session. Practice your PowerPoint presentation in the group study room on the 2nd floor. Check out the art in the Mudd Gallery on the 3rd floor during a study break. 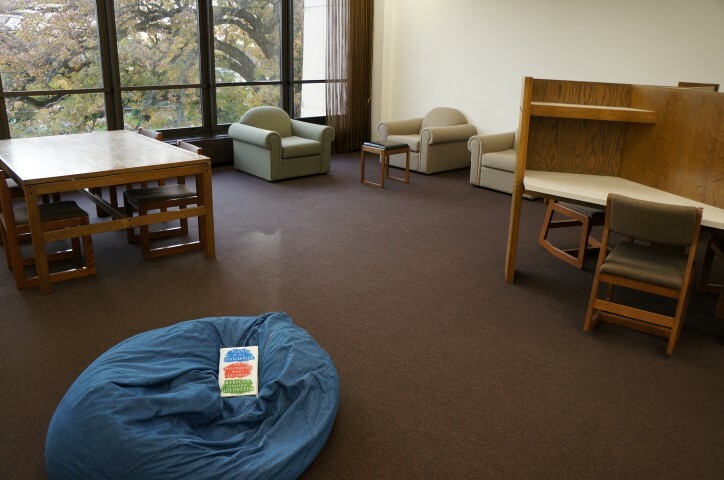 Cozy up to read or nap in one of our beanbag chairs! There are three spread out across the upper floors. Browse the free book shelf on the 2nd floor. You can find some great music there as well! Catch up on domestic or international current events with a newspaper. 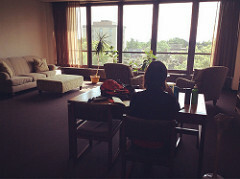 Hide away for some quiet study among the bound periodicals on level A. 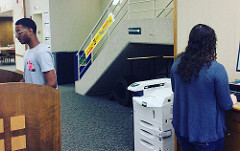 Visit the Circulation Desk to check out a locker for your research materials. Or check out the Wii for the weekend! Gather some friends for a game break: everything from Candyland to Catan can be found on the 2nd floor. Pop into the Archives on Level B one afternoon and visit with Erin Dix, our friendly and informative archivist. Find out the answers to your burning questions about the history of Lawrence and Milwaukee-Downer. Are there any other ideas that you would add to this list? How do you use the Mudd? We’d love to hear from you! Regardless of how you use the Mudd, we look forward to seeing you soon. The beautiful and serene Lincoln Reading Room.